Android is a board gaming event. One that pays dividends in proportion to the involvement of the other players. If Android is approached with a casual attitude, even one player can deteriorate the experience. Does this limit the attraction of the game? Yes. Does this curtail the overall reception of the game? Yes. So Android is a game that will have to settle for cult status. Which for myself and many other gamers, is fine. Android is brimming with theme, atmosphere and functions as a canvas for players to partake in a storytelling adventure that is far richer than the typical storytelling games like Arabian Nights, because the game is not subject to pure randomness. Players are able to develop a strategy based on role playing idea, a will to win and/or even their mode and disposition to how the other players are acting. With the right set of players the game can feel like you’re playing in a hard boiled detective movie because of the well thought out storie lines that aren’t closed or complete, but open enough for players to fulfill. Android suffers from complaints that, “There is way too many mini-games”, “It’s too bulky and complex for its own good”. This is the point and part of the beauty of the game. It affords a tremendous amount of interaction possibilities between the players. Different paths to enjoy the game. Android is not meant to be an Ameritrash style game of chance and theme or a Eurogame of trying to solve the riddle of the game design/mechanics. Android is a game designed to envelope players in a story of their creation utilizing mini-games, puzzles and mechanics to re-create a detective theme. The implementation of these mini-games and puzzles serves to create such a rich experience that more critical players hold the design and execution of the game to much, much higher standard. Android does require a little TLC. The game should be organized and packaged for play to be smooth in and out of the box and clearly laid out for use of the game pieces, otherwise it can gum up the experience. The more focused players can be on the story and players actions the more encompassing and enveloping the game will be. Fantasy Flight’s Android was released quietly toward the tail end of 2008. It’s gained a sort of cult following since (two, actually — those who love it and those who hate it). The game takes place in a hard-boiled near-future setting (which borrows elements liberally from both film noir and cyberpunk), and follows a group of characters who are trying to balance their personal lives as they investigate a murder. I think it’s an incredible game, though certainly not for everyone. Android plays out over the course of two weeks. Each player has a limited amount of time each day, and has lots of choices on how to spend that time. Players can send their characters out to follow up on the leads scattered throughout the board, which can then be used to further investigate the murder itself (and subsequently place evidence on suspects) or the conspiracy behind it (by connecting puzzle pieces on the board to hopefully get victory point modifiers at the end of the game). Players can also spend time gaining favors with various institutions in the game world (which you can spend on various things), or spend time trying to improve the circumstances in the character’s life (you can do this by playing cards you can gain each turn). All of these elements can influence the events happening in your character’s personal life, which progresses every few game days. The focus is on the characters, not on the murder — Each of the five playable characters come with rich back stories — they all have different goals, personalities and flaws. There are a number of murder scenarios that each game is framed around, but that’s basically it…a framing. The action is really focused on how the investigation changes the characters. Will the bitter private investigator finally put his past behind him? Will the corrupt cop make things right with his family? Will the android learn not to take life for granted? The game milks some noir and sci-fi clichés, but they fit right in and surprisingly don’t feel too worn. There are some really neat mechanics at work in Android — In a way, Android is several mini-games assembled into one whole. There are a variety of things your character can do in a day, and you can only do so many — will you search for clues to help prove your murder suspect guilty, or will you work peeling back the veil to see if there’s a conspiracy? Or will you ignore both and focus on making your own life as stable as possible? I love that diving into the conspiracy involves placing puzzle pieces on the board, and I also love how placing evidence (good or bad) on the suspects can involve several layers of bluffing and deceit. There are also a number of cards you can play to give your character a benefit or hinder another player, and you have to manage how you play them. All of these elements tie into each other, too, which is cool — sometimes playing a dark card against another player will hurt them in one area, but also positively affect their character’s personal life. Length of play — A rule of thumb is that each player adds a full hour of game time on (not including set up!). Playing with five people can be a blast, but can also be quite a tiring experience…five hours is a lot of time! Steep learning curve — There is a lot to grasp in this game, for both game mechanics and strategy. Not only are there many rules to learn, but each character has certain pros and cons that might be too much to take in on the first few plays. Some of the dark cards are triggered by certain events (if the character playing Rachel has less than three cards in her hand, for instance, something bad might happen). Trying to keep this in mind when you’re still figuring out the basics can be pretty daunting and ultimately pretty frustrating to a new player. I think Android is a frequently misunderstood game, so I always try to set the record straight when I can. As I’ve mentioned before, it’s not a game for everyone, but a lot of people excitedly purchase the game with certain expectations and then swear the whole thing off once they see it’s not what they had initially thought. Android is not a deduction game — Unlike Clue, Mystery of the Abbey or other deduction games, there is no clear answer to who the murderer is at the end of the game. Your character has a hunch to who the murder is (or isn’t) — are they right? In a postmodern turn, that’s up to you to decide. Maybe your character finds the murderer at the end of the game through great police work. Or maybe they frame the suspect. Regardless, Android was never advertised as a “murder mystery” game…it’s a game about murder, though! Android isn’t unbalanced…it’s just vicious — Some of the dark Twilight Cards are particularly brutal to other players, even causing players to lose entire turns. This isn’t unbalanced, though, since all of the player aids that come with the game give clear warnings to the players. If you’re playing Raymond Flint, for instance, you need to avoid hanging onto Kate favors or getting into fights on the moon. Or for Rachel, you need to make sure you pay attention to how many cards you have in your hands. If you don’t, you’ll get hurt. Android’s mechanics make thematic sense, even if it might seem like they don’t — It seems like Kevin Wilson, the game’s designer, put a lot of time and effort into this area. The conspiracy puzzle gets singled out a lot…why is that in the game? Because if your character puts time and effort into it, you get to see the “big picture” of how everything is connected. (Even the bonus points for five pieces in a row make sense here too.) Same goes for the baggage on your plot cards. Ray, for instance, gets good baggage if he avoids the old flame in his life and instead focuses on the conspiracy (since the old flame is bad news, and Ray is a good P.I. who should be focusing on his work). And why are your characters detectives if you’re not “detecting” who actually committed the murder? Because this game is based on noir! 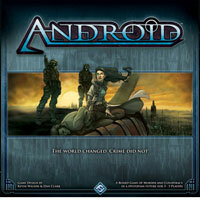 Android is easily my favorite game, though a hard one to get to the table. I love setting, I love how the mechanics click, and I love how challenging it is. That said, it’s a hard sell for many gamers, and an even harder game to get people to fall in love with. The book “Do Androids dream of electric sheep?” by Philip K. ****, first published in 1968, was the basis for the classic sci-fi movie “Blade Runner”, which in turn inspired Kevin Wilson to design “Android”, the board game. Does this make “Android” a classic? Here are my thoughts. The theme: The world changed, as the game box suggests. The Moon and Mars are now colonies. People enhance their abilities by planting chips in their bodies, but at the same time, lose their jobs because of cheaper labor, mainly androids and clones, which are created by two rival companies. As a result, protests against the so-called “golems” are frequent and violence is rising. While all these groups clash together, a murder has left the police standing at a dead end. Up to five detectives, coming from different backgrounds and bearing their own problems, must find the culprit… Or a scapegoat. 1. the murder: by following leads, the detectives plant evidence to the suspect of their choice. The suspect with the most incriminating evidence at the end is the murderer. 2. the conspiracy: by following leads, the detectives try to unveil the conspiracy behind the murder, by adding pieces to the conspiracy puzzle and linking specific social groups with the murder. 3. the personal story: everyone has their own demons and these detectives have a bunch of them. By spending time to solve their own problems, they may find their inner balance and peace. But at the cost of not being worthy to be a detective. At the end of the game, players gain victory points based on how well their detectives did in these sectors. The opinion: If there is theme, I love the game. And this game is dripping with it. It feels like you are actually following this detective’s life, the choices he or she makes and their consequences. I do not think we should treat this as a board game. It is more an interactive movie. As far as I am concerned, one should not try to win at this game, but instead watch how the story unfolds. Of course, I understand the many problems associated with it. The rules are way too many and you must spent LOTS of time to remember them and even then, you will not remember them all. However, if you commit to this game, you will feel after a while that they simply click into place. But even if you get past this problem, the many hours needed to reach the end do not make it any easier. Three hours is the very minimum to play this game and in a relatively good pace. Unfortunately, the result of this is that most times – if not always – you will not have the stamina to read all the flavor text during the game. What I did was read it at a different time, and it was like reading a book. In Kevin Wilson’s Android, players are detectives who are trying to solve the murder case and find who commited the crime. Keep in mind though that we are not dealing with a deduction game. Instead, each player tries to “plant” guilty evidence in the suspect sheet (a guilty and an innocent hunch card is dealt to each player at the start of the game). The main mechanic of the game is in fact a typical action point allocation system. You have 6 hours (AP) to do actions like move, draw / discard / play card, follow an evidence, activating a location’s action, change starting player. But there are many innovative secondary mechanics that are all about fun! For example the special vehicle rulers for movement, the conspiracy puzzle, the dark (to harm your opponents) and light (to help you) cards which have to be played in balance, NPCs, or the balance you have to keep between your personal life and your focus to solve the case. Android is a heavy thematic euro. “Thematic” and “euro” are two words that rarely you can see in the same sentence. That’s the reason many players turn down Android. Euro fans were overdosed by tones of flavor text while ameritrashers can’t tolerate euro and abstracted mechanics like the conspiracy puzzle. Those lucky who like both genres and love sci fi settings are talking about a masterpiece and a unique gaming experience! Unfortunately is hard to play and at the same time read all the flavor text. In this case playing time maybe will be doubled. I want to love this game, I really do. With personal missions, deep characters, and so many gorgeous components, it seems impossible for such an amazing game to go wrong. This is the futuristic version of Arkham, right? Right? 1. Despite being really long, you really don’t get that many actions. In other words, despite the fact that a lot of time is passing, you don’t get to do much. 2. Most of the gameplay elements just don’t work as well as they should. 3. This isn’t a mystery, it’s a frame-up. We’re not trying to find out ‘who did it’, we’re trying to make our suspect guilty. That’s…not really what I was looking for. Sigh…I just know there’s a great cooperative game that could have happened with these components. It’s a shame. First time players be ready! I suggest all players read rules prior to game day! Also be ready to handle the large setup and numerous components involved in this game. And be ready to spend many hours the initial time you play this game. I have played this game twice and i think that it’s a great game with many nice mechanics. But those willing to try it should be cautious because the game requires a lot of preparations. In specific, all the players must read the rulebook before playing, the setup of the game should be done beforehand because it requires about 30-45 minutes even if you have played the game before and all players must be aware that the game requires about 1-1.5 hour per player. If you are aware of all these you can have a really good time playing this game since it offers a great (epic?) experience and many cool mechanics. This game is horrible for the color blind. Even those who weren’t colorblind had trouble distinguishing some of the colors, like blue and purple. I really wanted to like this game, I love the theme, but it is way to long for what it is. The mechanism of not having a defined culprit but working through the game to make your suspect the guilty one seemed a bit odd. At a gaming weekend this was a play-to-win game. It was checked out several times, each time the group tried it for an hours and then was overheard to say “can we play something else?” and they would box it up and move on. The saying, “Never judge a book by it’s cover,” definitely applies here. This is not a deduction game. This a game of murder, lies, and betrayal. Each player is trying to sabotage the other players so that their suspect is the one who is found guilty. Not a bad premise but, it’s overly complicated. Pretty High Learning Curve. The quantity of pieces is very high, so set up takes a while. First time playing it took us 2 hours just to set it up and learn the rules. This is not a game I would play very often. Once a year maybe. It looks good, but that’s about it. don’t know if this was a bad day for this game or it was the person trying to show us how to play…. but i didn’t couldn’t get into it. Add a Review for "Android"